cityofsound: Sketchbook: Ripples, or "The Social Life of a Broadcast"
Sketchbook: Ripples, or "The Social Life of a Broadcast"
The recent redesign of the BBC Radio 3 site featured a joint project between the BBC's Radio & Music Interactive department (where I work, running the Technology & Design team) and Central New Media division to deliver unique, persistent pages per programme. Tom Coates, of my aforementioned team, has written an excellent summary of both the practical aspects of the project and the significance of the work from a user experience point-of-view. Go read Tom's summary because a) it's very good, and b) will appropriately detail the fine people who worked on the site. I thought I'd step back a bit and talk about the genesis of the project, and the thought process behind the project from my point-of-view, as a new media professional working in radio and music for the BBC. Building on some related work around automated search results for programme information and some informal r&d that Tom Coates and Matt Webb led around time-based navigation models, I wondered if we could jam these ideas together to deliver something I'd been wanting to address for a while: in short-hand, making a radio site blog-friendly. Or rather, beginning to create a site which presented information spaces of the appropriate shape, size, and formal quality to enable them to be informational building blocks for others. We could devise a solution for building a database of every single programme Radio 3 broadcast out of the radio production feeds and systems we have to hand. We could further create a page for this, hooked around a persistent URI. We had our first chance to deliver this with Radio 3's then-imminent redesign. On the one hand, this was about simply representing the breadth, depth, and richness of Radio 3's output, from one-off documentaries and specialist output to daily shows. In essence, properly representing everything we broadcast. But beyond that, this is also about beginning to model something I'd described as 'the social life of a broadcast', building on an idea I'd had for enabling and tracking the ripples of conversation and meaning around broadcasts. When the BBC started producing websites supporting broadcast media, the approach (before my time/reasonably enough at the time) was to essentially 'cherry-pick' key shows and hand-build bespoke properties around those shows. So previously, and in broad brushstrokes, Radio 3 had selected shows to represent thoroughly online - over and above the BBC's transient What's On listings feed, that is - adding further editorial where possible. This had been pretty successful. 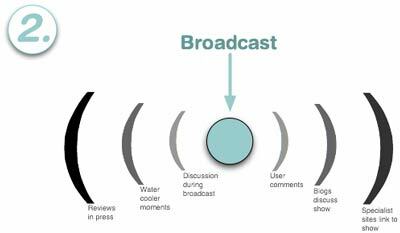 So we see the broadcast causing a series of 'ripples' through social space over time. We've now witnessed the rapid expansion and growth of a new and fertile social space online, built around personal publishing systems (like blogs, Livejournals, or community discussion spaces like messageboards). Similarly, transient conversational spaces conjured by instant messaging. Similarly, smart social software tools built around personal workflow and self-expression, like Flickr, Audioscrobbler, Mixmatcher etc. And consequently, as well as numerous Google queries for radio shows, we have the chance to provide some hooks and frames for many of conversations enabled above. The hand-built approach was not scalable to the demands of covering 10 national radio networks (for example, Radio 4 alone broadcasts over 10000 different shows per year) and certainly couldn't thoroughly cover Radio 3's output. So those Google queries often had nowhere to go on our sites (see below) - we were not serving this increasing demand. Moreover, we hadn't been providing basic foundations upon which people could actually build conversation, critique and reflection in this new space. In order to stimulate this space we need to give people something to build on; to hook on to. Our colleagues over in BBC News built one of the building blocks of blog world. The granularity and permanence of those content blocks enables people to build around it, link to it, discuss. Just check Technorati for an idea of how a significant chunk of the blogosphere builds around BBC News. We just couldn't do that with our radio content, and yet BBC radio was generating 'discussable' content at the same rate as BBC News. So those 'real world' conversations about radio couldn't be mirrored online. I'd personally witnessed here how difficult it is to build blog entries around R&M content. Google for the Radio 3 'Sunday Feature' documentary on the brilliant Brazilian music 'tropicalia' e.g. Or google for a Radio 4 documentary called 'Devil's Architect', about Nicholas Hawksmoor e.g. When I wrote the initial project proposal around this, cityofsound, with entries around these two BBC radio programmes, came out top on both occasions (currently third, and it's interesting to see now how both the new Radio 3 site is already more relevant (not specifically around that specific programme, but not bad) and how the rest of the net has been tracking those programmes). A year on, the Hawksmoor documentary is now referred to from a few places it wasn't previously. However, it's still the case that there is no meaningful sign that either show ever really existed on the BBC site. Nor did I have anywhere to link to when writing my blog entries in the first place. Why make more ripples around radio? I've selected some choice examples above, but they're fairly representative of the type of shows which were falling between the cracks of an approach which focuses on hand-building and cherry-picking. They're typical of specialist BBC content - often content which helps make the BBC especially distinctive and arguably one of the real strengths of the BBC - in producing shows in the niches; in the spaces left untouched by many other broadcasters. "(Production of radio drama) goes on day after day, week after week, in a range of styles that leaves television's one-track realism far behind. And yet, radio is a Cinderella medium. Just one Radio Times cover a year is devoted to this last Reithian bastion. Meanwhile, the superior intelligence and imagination of Radio 3 and 4's drama output (let alone its features) is so taken for granted that it goes virtually unnoticed." "The odds seem to be stacked against radio drama being regarded as an art form. For the cultural powers-that-be, it can never be much more than a platinum version of The Archers. And here's the rub: no newspaper or journal (with the exception, occasionally, of the Times Literary Supplement) ever reviews the latest radio play separately from, say, Gardener's Question Time. Two of our greatest living dramatists, Edward Bond and John Arden, have followed the example of Samuel Beckett and given up mainstream theatre for the radio; Bond's latest play, broadcast in May and focusing on the world of arms manufacturers, went virtually ignored." "Even when reviews do appear, they treat radio plays as blacked-out stage plays. There is none of the distinctive critical language found in music or dance criticism - yet radio drama is as stylised as either. Technical notions of the type usually associated with film - crossfades and cuts, acoustics, music, sound effects - are entirely ignored." So I wondered whether we could help make those ripples visible; about building on those private reactions to radio content; about the internet sharing radio's ability to express people's soul. In one of those beautiful and accidental moments of serendipity, I discovered this article just as I was thinking through metaphors for broadcast media and the social spaces of the web. The fact it referred to ripples was just too strong a coincidence to ignore. Some implementation details then: first and foremost, we needed a way of denoting a unique reference for a Radio 3 programme which is as permanent as can be. The URL structure derived from that is pretty important. Then we need to devise ways of automating the production of programme pages, built around content object models based on our incredibly complex output; and then devise new ways of navigating towards this content, taking on board the bewildering range of programme formats the BBC broadcasts). This has been built for the Long Now - though they may not have used that phrase! Tom has much more on the detail here - cos he and the team did it. If such a system were in place, and if it were desirable to pursue some of the opportunities this would afford, we could pursue an even richer relationship between broadcast media in the form of Radio 3 and new media. in turn stimulating wider discussions about BBC radio broadcasts both across bbc.co.uk and in the highly discursive, highly socialised environment which has emerged on the internet. This is idle speculation/grand strategy at this point - as are many other development ideas which could really increase user agency around our programme information. More to follow, hopefully. But we now have a new foundation in place at Radio 3. 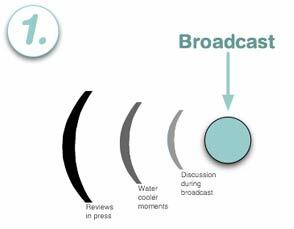 The opportunities for interaction around broadcasting could be quite profound, and yet whether some presenters or shows will want or need to respond to these 'ripples' in this way is open to question. Whether it's truly desirable for many shows is something we'll have to investigate, probably on a case by case basis. However, the potential is there now, and it begins to solve some problems we were already having around the basic issue of linkability. It also begins to blur the edges between the Radio 3 site and the sites and spaces that Radio 3 listeners also inhabit, weaving new patterns into the fabric of the web. Essentially, I now know that as well as chatting in the office about how Radio 3's superb Late Junction played the Billy Cobham track that Massive Attack sampled, I can now link to that particular programme ... and just as the memory of those discussions won't erode, I know that link won't rot.